As Raindrop leads the PHRF Class B Fleet towards the finish of this years CYC Oregon Offshore, let's take a look at the rest of the class as they make their way east towards the turn at Race Rocks. 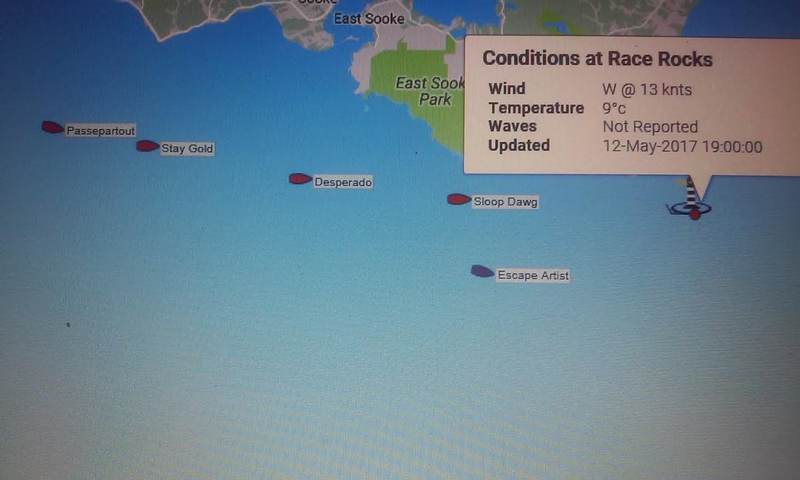 Besides Raindrop, the Beneteau 405 Sloop Dawg is currently the alpha dog in the B fleet pack and is just North of the remaining J-105 on the course, Escape Artist as they move briskly towards Race Rocks, where winds are currently W @ 13 knots. 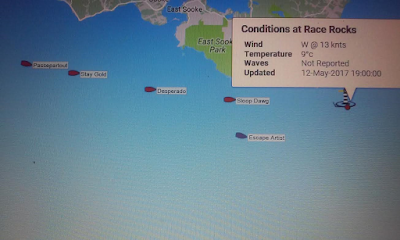 Stay Gold and Passepartout are off of Otter Point and aughta be at Race Rocks by dark, wind permitting.